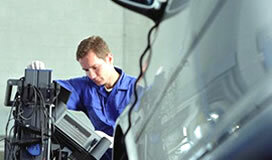 Below you will find a detailed description of what is involved in the UK MOT test. Click on the components of the illustration below to find out more about each component of the MOT test. Having a good knowledge of the MOT test procedures will help you prepare your vehicle for it's test.